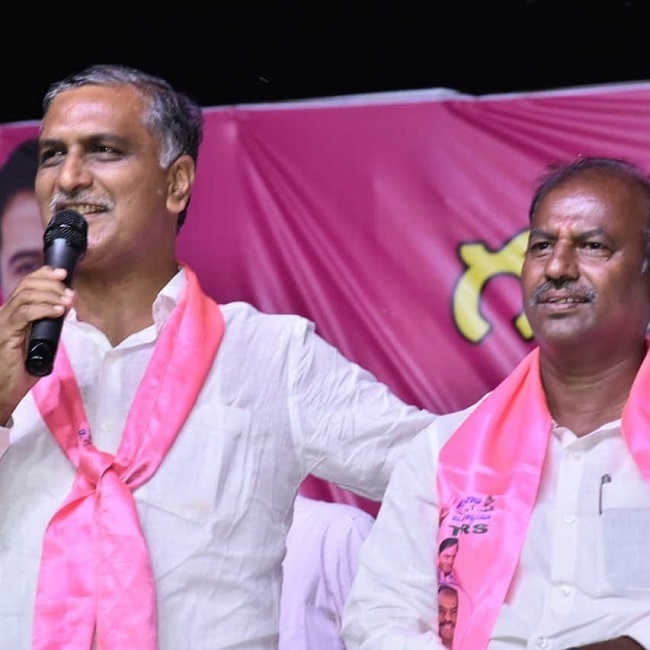 Ground report: In aunt-nephew battle, will TRS win Cong bastion Gadwal from DK Aruna? In the wake of the Telangana Assembly elections, TNM visited Gadwal to see if the constituency wishes to elect Congress MLA DK Aruna for the fourth time, or if they are on the lookout for alternatives. 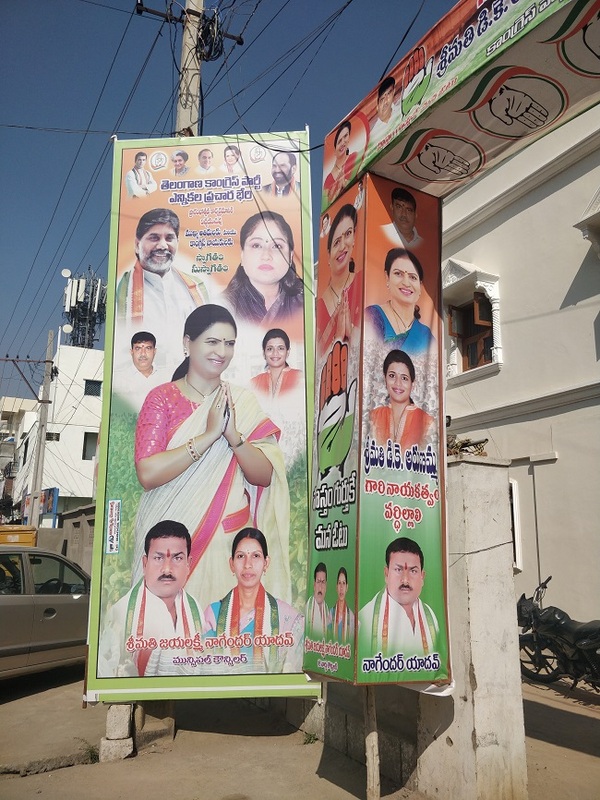 As the sun beats down on Gadwal town in Mahbubnagar district, there is a constant buzz of activity, as it prepares to witness a showdown in the upcoming Telangana polls -- that of sitting Congress MLA and political heavyweight DK Aruna versus her nephew and Telangana Rashtra Samiti candidate Bandla Krishna Mohan Reddy. Aruna has been in power for three terms and is running for her fourth consecutive term, but with stiff competition from her sister-in-law’s son. TNM visited the TRS office, tucked away in a lane close to the town's market yard. Across two houses, party workers wear the TRS’s bright pink badge with its car logo, people constantly scuttle in and out and the inner walls of the main office bear the trademark pink colour of the party. On one side is the party office, and on the other is the home of candidate Krishna Mohan Reddy. Amidst all the activity, party workers seem confident of a win. “We have been working on the ground for the last five years and people in the constituency have been asking for the schemes provided by the TRS government and Chief Minister K Chandrasekhar Rao -- whether it is the distribution of sheep to the Yadav community or the double bedroom housing scheme. Some are impressed with the Jurala project,” says one TRS worker. Which way will votes swing? In an area where around 10,000 families, directly and indirectly, depend on agriculture for their daily bread, water is a crucial resource. In 2018, the Jogulamba Gadwal district had received 282.5mm rainfall during the monsoon, less than 50% of what it receives on average. The Jurala project, a hydroelectric project laid over the Krishna River, has a reservoir at a level of 1,045 feet. It has been touted as the only hydroelectric project in Telangana, which has water throughout the year and helps irrigate more than 1 lakh acres of agricultural land. In June this year, Chief Minister K Chandrasekhar Rao and TRS chief ordered officials to ensure that 8 lakh acres are irrigated through lift irrigation schemes of the Jurala project. Being a semi-arid terrain, the prominent crops grown in the region are groundnut, followed by cotton, castor, paddy and red gram besides chillies. However, the region has witnessed a lull in agriculture production in the poll-bound year and farmers are worried. “We have only received 30% of the total output this year so far. Last year, we had done business worth Rs 300 crore, but it would be a big deal if that figure even hits Rs 150 crore this time,” says P Mallesham, the special grade secretary at Gadwal's agriculture market yard. Close to 1,000 farmers visit the yard in the peak harvest season from mandals such as Dharur, Maldakal and Ghattu, with some even travelling from the neighbouring district of Wanaparthy. “This season, close to 34,000 hectares have cotton plantations. We are noticing a trend where the production of groundnut is decreasing and cotton is increasing,” Mallesham adds. While one reason Mallesham cites is the high demand for cotton seeds from private companies, who deal directly with the farmers, and another is better availability of water due to the Jurala project. While the Congress has claimed that it was them who envisioned the project, the TRS has been boasting about the speedy execution and completion of the project, which may help them swing the votes in their favour. Will Gadwal see anti-incumbency vote? Across the town, there is a resentment that the DK family owns almost every business in the town, and that nepotism is visible. "People are tired of the Congress,” says MD Dowlat, a driver. “If you notice, everything is run by the family. They only help those who are close to the family. If you look at Zilla Parishad Territorial Constituency (ZPTC) and Mandal Parishad Territorial Constituency (MPTC) elections, it was mostly TRS members who were elected. How is it that the Congress won the MLA seat then?" he asks. An elderly native of the region, who did not wish to be identified, told TNM that while the family does help out individuals, it does not bring about societal change. “The Congress here has a slightly feudal mentality as the same family has held power for decades now, with the exception of two or three terms. The TRS has also fielded someone from the same family as there are no strong opponents, who can take on Aruna from outside. Either way, someone from the same family will come to power,” he said. In an area where there isn’t really a choice, the BJP hopes to be an alternative. The party has fielded an advocate, Venkatadri Reddy, a fresh face who joined the party on August 23. As a testament to this, the office has only pictures of the candidate along with BJP President Amit Shah and Prime Minister Narendra Modi, but not of his family members. Meanwhile, activity in the BJP office in minimal. A close aide of Venkatadri Reddy is also disgruntled with the Congress family for not just holding power, but every business. “For every Rs 100 they spend on the election campaign, they will make Rs 99 back. From gas to water and food to contract jobs, the family has people in every business,” he says. “Education is a big issue here as there are no proper institutions for higher studies. Children often travel to Kurnool or Hyderabad to study. We have a dismal literacy rate and factories are non-existent, which also result in higher levels of unemployment,” says Usha Rani, Venkatadri Reddy’s wife. Gadwal town has expanded haphazardly, and is clearly struggling to keep up with its growth and urbanisation -- this is visible in the town’s roads and traffic. A bridge that was proposed to clear congestion has been in the making for a year now, and commuters often get stuck in long traffic jams every day due to a railway crossing. "Sometimes, it takes 45 minutes on a bike and 30 minutes by walk," laments M Parusutham, a cook at a hotel in the town. Can Congress hold on to its bastion? In stark contrast to the offices of the TRS and BJP, the Congress office, attached to DK Aruna’s palatial bungalow, is lined with posters of the senior leader and her family members. This includes photos of former Gadwal MLA and Aruna’s husband, Bharat Simha Reddy, and her daughter Snigdha Reddy. Aruna and her husband had lobbied within the party for Snigdha to get a ticket from Mahbubnagar, but to no avail. TNM spoke to several locals in Gadwal and they all said the same - the constituency’s voters are divided and Aruna has a tough fight ahead. Whoever wins, would do so with only a small margin. Narsi Reddy, a local Congress leader seated in a tent behind Aruna’s house, agrees. “There are rebels who have defected to the BJP and the Bahujan Left Front (BLF), may eat into around 10% of our vote share, as well as the vote share of the TRS. Even the BJP candidate, who barely stands a chance of winning, will eat into our votes over that of the TRS,” he says. Gadwal is famous for its silk sarees and has a significant weaver community. “There are four sub-castes in the padmashali (weaver) community in the state. While one or two of them may vote for the TRS, Aruna enjoys overwhelming support among them,” he adds.